So I’m almost done with this quilt for Aaron and Vanessa. I started it last year and yes, I’m still working it. I have 145 blocks with about another 40 to go. I have over 65 hours of work in this baby. But what shall I name it? Thanks Deborah. I like your thoughts. Kindred. I really like it, btw. Forgot to tell you that in my 1st comment. May I suggest you name it Ezekiel’s Stars. Oh Roberto, I love that. Gracias amigo. Breezy Weaves or Holy Churns! Damn nice job, too! Love it! Thanks Bodeen. Breezy Weaves I like. Ain’t me, La Tonta! Wrote a reply and got hung up on the WordPress option. Wrote sumpthin’ about not being able to see any flying geese. Probably need California water, no? that looks amazing!!!!! I cant think of names. but it looks like a kaleidoscope. and if you STARE at it, it looks like its MOVING….. eeehhhh uuuughghhh…. now i’m feeling dizzy. I love this quilt you are making. Have you finished it yet? I made one almost like it but in a different color way…and actually, I like your black and white one more. Thanks Michal. I am almost finished. It it king size, so a lot of blocks. 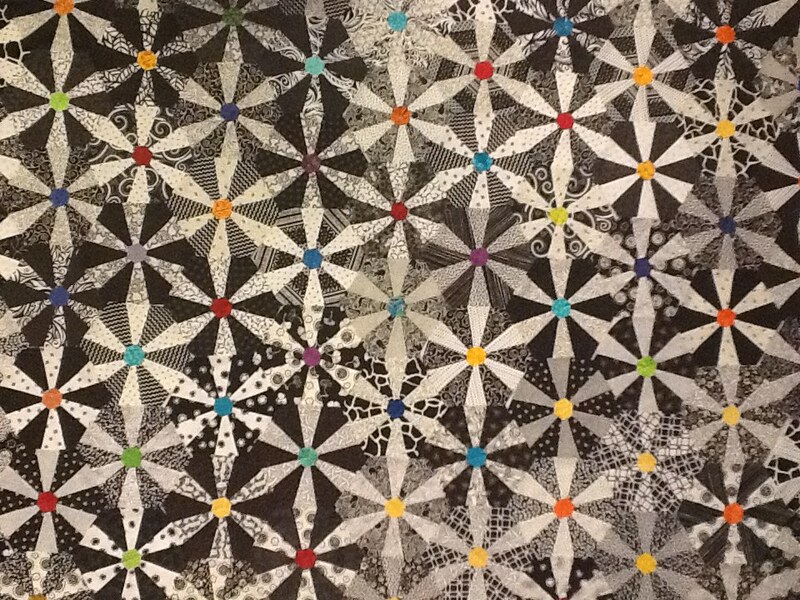 I’ve entered it into the San Diego Quilt Show and I have to have it finished, quilted, and binded by September 2nd. I get bored working on it and work on other projects, but I have to finish it during August. I also want my design wall back for other projects.